In today’s volatile business climate, job stress is considered one of the main reasons why organizations struggle to retain their people and maintain a healthy, happy, and productive work culture that is primed for sustained economic growth. The National Institute of Occupational Safety and Health defines job stress as “the harmful physical and emotional responses that occur when the requirements of the job do not match the capabilities, resources, or needs of the worker.” A report by the American Psychological Association in 2013 showed that one in five Americans suffers from severe stress. One in five – that’s 20 percent of the entire U.S. population, or about 60 million people suffering from severe stress at any one time. Stress, of course, is not only limited to the United States. All around the world, people are struggling to manage their stress at work showing that stress is a global epidemic with global economic consequences. In my seminars, I often ask my audience how they feel job stress affects their personal lives, but also their professional careers. In many cases, people struggle to come up with more than 3 impacts of stress beyond how it affects them at a personal level. The general consensus is that we seem to be able to recognize the catastrophic effects stress has on our own individual health and performance, but we often struggle to realize how the symptoms of stress can have a much greater impact on organizational performance and revenue. We are not alone in our inability to fully comprehend the financial magnitude that stress has on our companies. Dr. Jeffrey Pfeffer, a professor of organizational behavior at Stanford Graduate School of Business mentions in his book: Dying For A Paycheck that employers are generally not in a hurry to stop their employees from sacrificing their health for the good of the company. Pfeffer goes on to mention that many bosses today still treat work exhaustion and long work hours as a badge of honor and many companies still reward their employees for trading in their own health and wellbeing for the good of the company thus creating a culture of workers who stretch themselves beyond their capabilities and are no longer able to perform at peak fitness. 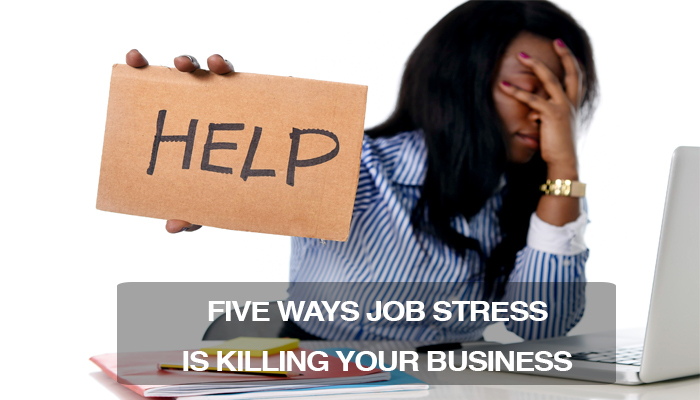 To further highlight the insidious nature of stress, here are 5 ways job stress might be impacting your business. It’s not that stressed-out people don’t make decisions, although procrastination is common. It’s more that stressed out brains don’t make the most effective choices. A stressed-out brain will tend to focus on short-term gratification and immediate results in an attempt to modulate its stress. These fight-or-flight decisions often seem like a great decision at the moment only to come back later with a massive negative, and financial consequence. The key to a strong brand promise is to consistently do what we promise, which in turn builds consumer trust and brand loyalty. Stress is exhausting for the brain resulting in a reduction of energy reserve required to inhibit emotional behavior that can negatively affect the emotional states of those around us. When we’re struggling with our stress and others see us struggling through our coping behaviors, it can be deeply demoralizing for those around us, in turn reducing their morale. As morale of the company culture drops, so too does the employee enthusiasm to uphold the brand promise resulting in an inconsistent customer experience and destruction of trust in the product and company. Ultimately, this will have a disastrous effect on market shares. Generally, stress puts us in a fight-or-flight frame of mind that is precisely the opposite of where we need to be if we want to come up with new innovative products and creative solutions to problems. Innovation and creativity in the brain are best harnessed in an environment of fun and happiness, not in an environment of threat and fear. Mental fatigue from stress and stress-related sleep deprivation have a massive impact on the brain’s capacity to perform consistently, which in turn reduces productivity and increases the number of errors at work. Furthermore, when fight-or-flight responses become a regular phenomenon, the body loses its ability to recover from its stress causing dysregulation in the brain and body that manifests itself as chronic fatigue and burnout. Companies with chronically fatigued people may still be able to generate a profit, but their ability to thrive and soar will be dramatically reduced with every chronically fatigued staff member. It’s pretty much a no brainer that the previous four sections will all have a significant negative financial impact due to a loss in productivity. Stress has also been shown to have a direct financial cost in the form of absenteeism and employee turnover. In fact, recent research on job stress has shown to be costing businesses in the United States a whopping five hundred Billion dollars per year. Employees are staying home from work on sick leave and a whopping three-quarters of all employees are actively fleeing from their current workplaces resulting in high turnover rates. Turnover, in itself, has been estimated to cost a company twenty percent of an employee’s annual salary and can rise to fifty percent depending on the position. If a large percentage of the workforce is suffering from stress, it will surely have a negative impact on the organization’s bottom line. Unfortunately, the ill effects of stress are not only limited to the workforce. After work, employees go back to their homes, often carrying their stress with them like an infectious virus that affects everyone they come in touch with making job stress an epidemic of unprecedented proportion. In my book: HeadStrong Performance, I not only talk about the ill effects of chronic stress and productivity, but also discuss how we can use the power of our brains to turn a perceived stressor that triggers a fight-or-flight response into a positive challenge that actually energizes our minds, giving us an opportunity to use stress as a means to build resilience and improve performance. Watch this space for some interesting solutions to how we can combat stress in the workplace. 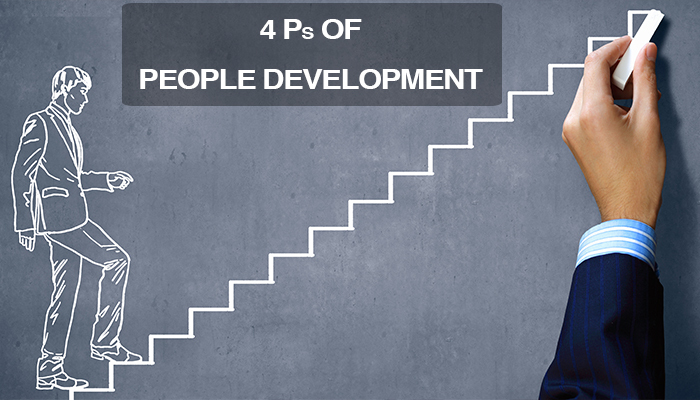 If you are a manager who is interested in knowing how to help facilitate growth in your people, then the 4 P’s of People Development is for you. Taking a business from ordinary to extraordinary means understanding and embracing the difference between management and leadership. Management is largely about doing things right, such as ensuring all business systems and processes are in order. Leadership, on the other hand, is more about inspiring people to want to be the best versions of themselves so they can be actively engaged in the creative processes that help the business transcend far above performance expectations. In other words, where management might be about tasks, systems and processes, leadership is more about people. Good managers have an excellent grasp of the tasks, systems and processes within the organization, as where great managers have an excellent grasp of perfectly blending being task oriented as well as being people oriented. Interestingly, a 2011 study conducted by PDI Ninth House showed that even though leaders unanimously agree on the critical necessity of people development, as leaders climb the corporate ladder, their people development focus and skills tend to decline. What this shows is that many of our C-suite executives today likely spend more time being task, process, and systems oriented, their area of comfort, than being people development oriented. In my work coaching senior level executives over the years, I’ve had many conversations about the necessary balance between being both task and people oriented. One consensus is that tasks, systems, and processes are quantifiable, and thus can be easily managed in spreadsheets and share-holder reports. On the other hand, people behaviour is more difficult to quantify, thus often taking a backseat in business management. For that reason, it’s likely that a company may prefer hiring managers who are biased toward being task, process, and systems oriented rather than being people oriented. Even so, many of my senior managers do express a desire to be more people oriented, knowing all to well how valuable people development is, but simply don’t have the skill-set to be equally people oriented as they are task, process, and systems oriented, nor are their companies prepared yet to invest heavily in an area (their people) that cannot be justified using traditional ROI models. As a result of this, many companies adopt a one-size-fits-all approach to developing their talent by simply offering a laundry list of trainings, often leaving employees to carving out their own development path. A recent article in the Harvard Business Review shared 7 Ways to Improve Employee Development Programs with driving manager support as the first point showing how critical the role of the manager is in driving the development of their people. However, Dr. Edie Goldberg from Goldberg and Associates says that managers today still have not fully realized the critical role they play in the development of their people simply because they, themselves, or so inundated with day to day tasks. Leaving people to their own resources when carving out their development may work for some people who are independent learning, but not for others. An independent learner might interpret the freedom as autonomy, as where someone else who might need more direction may interpret that space as abandonment. For every manager, being involved in their people’s learning and development is essential in retaining, building, and inspiring staff and should therefore not only be the purview of learning and development professionals. The effectiveness of a learning and development department is only as successful as the support from the manager. Luckily, supporting staff in their development does not have to be too time consuming. With a little planning and a small investment in time and energy managers can build a strong development system within their departments that will not only support the effectiveness of the Learning and Development departments, but will also drive engagement and productivity to unprecedented heights. To better help my executives manage the learning and development of their people, with or without the presence of a learning and development manager, I have developed the 4 P’s of People Development. The 4 P’s of People Development is a 4-stage model that a manager can use for themselves, but also for each of their staff members to help guide them through their development from the day they start to the day they leave. I would like to share this model with you today with the hope it may help you support the development of your people. A serious challenge that many business managers struggle with is how to develop such a strong team. Starting at the bottom of this development ladder is “Procedure-Based Management”. Procedure-Based Management is suitable for employees with no experience or employees with experience by who might be new on your team. Research shows that at this level, employees tend to be quite happy being told what to do and how to do it until they become comfortable with the procedures. A Stage 1 employees are 100% supervised, all of the time, until they demonstrate sufficient levels of mastery, after which greater levels of autonomy can be given. With regards to people development, at this level, employees will more likely appreciate undergo mandatory training and learning as well as on-the-job guidance from a mentor. Stage 1 employees often lack the experience, skills, or confidence to “figure things out” and too much autonomy could be perceived as a sign of abandonment. Instead, having a conversation with them about how they prefer to be managed through this first stage will help you develop a relationship of trust with this person. From there, they will need a lot of guidance being lead in the right direction of their development. The time and energy this takes is a very worthy investment as it create that foundation of trust necessary for their long-term growth and productivity. 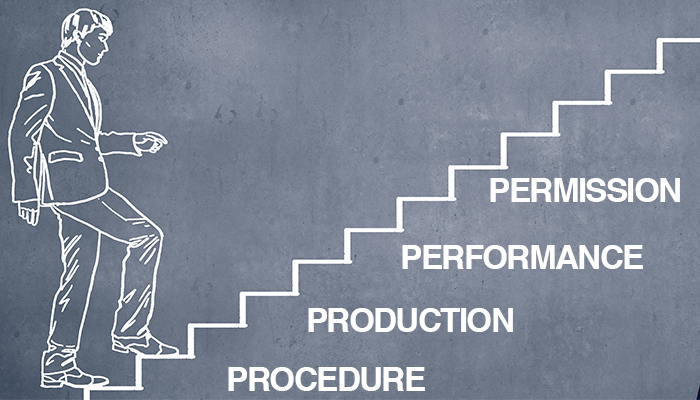 Key Performance Indicators (KPI’s) for Stage 1 Employees to progress to Stage 2 (Productivity-Based) should be based on HOW they perform, and report, their daily duties. This level focuses on work quality not quantity. This approach is more participative. For example, instead of just issuing instructions, you also explain the reasons behind the instructions and support them while they are performing these tasks. To use this style successfully, communicate the reasons why your team must follow your instructions. For instance, explain rules, so that members of your team understand the reasons behind them. When they understand why certain rules or procedures are in place, they’re more likely to follow them. This in turn helps set very healthy boundaries so staff members will inherently know what behaviors are acceptable and which are not. As your team is working, practice a leadership style called: Coaching Leadership by being present and accessible, so that you’re available to answer questions and provide them with advice and feedback when needed. This visibility and support will help you keep your staff on track and show them that you’re there when they need you. Key Performance Indicators (KPI’s) for Stage 2 Employees to progress to Stage 3 (Performance) should not be based on how they perform their duties, but on WHAT they are doing on a daily/weekly/monthly basis. This stage focuses on quality work at a desired quantity. Now that your team has proven to you that they can perform the quality work at the desired quantity, your business will already be performing at an acceptable level. A Stage-3 employee has mastered the previous levels and is showing a great deal of mastery in how he/she performs. A Stage-3 employee will be the perfect candidate to begin to function as a mentor, or role-model for future employees so he/she can begin to learn how to lead, manage, coach, and inspire future staff members, which will enable you to develop a steady talent development stream in the future. The leadership style to achieve this is known as the “Democratic Leadership” style, where a moderate amount of autonomy is given to enable the team to develop initiatives, under consultation of the manager, to drive revenue and performance. Management activities such as, brain-storming and team-building are the types of initiatives that may be employed at this level. Rather than using language such as “This is how I want you to do it” (level 1), or “Show me what you’re doing” (level 2), the language is more around “what do you think you should do and what can I (the manager) do to help you achieve it”. As your team is working on new initiatives that they are developing, practice democratic leadership by being involved in the project from a supportive, cheerleader aspect and begin to give more autonomy as they progress. Gradually, begin to wean them off of your presence by gradually removing yourself from the work-floor. At this level, your absence will likely be seen as a sign of trust from you and too much presence could be interpreted as a sign of mistrust. Key Performance Indicators (KPI’s) for Stage-3 employees to progress to Stage-4 (Permission) should be based on team performance and not on personal productivity anymore. The pinnacle of growth for every employee is Stage-4. At this level, your employee has become a true master of running your business and is fully engaged in all revenue building and creative activities. This is your model employee that others look up to and is a perfect example of an excellent people leader, as well as manager. At this level, your Stage-4 employee is not only able to fully run your business without you being present, but is able to build and manage multiple teams as your General Manager and knows everything there is to know to build a successful empire on your behalf. The leadership style required for a Stage-4 Maturity employee is known as consensus (permission), or Laissez-Faire where all autonomy is given to the employee. A Stage-4 employee with complete autonomy will tell you how he/she is running your business and will gladly take full responsibility for your company or business unit’s performance. Key Performance Indicators at this level are slightly different. The Stage-4 employee will gladly develop his or her own KPI’s for the business for your staff, and for him/herself leaving you with plenty of opportunity to work on the vision of your business rather than constantly be engulfed within the processes that make up your business. As a manager, if you ensure you can provide each of your people, no matter their job function, with the opportunities to grow and develop according to this model, you will begin to see a return of investment in employee retention, engagement, innovation, productivity, and yes, in your company’s bottom line.